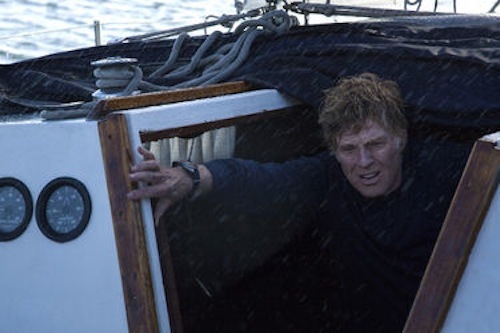 Synopsis: Deep into a solo voyage in the Indian Ocean, an unnamed man (Redford) wakes to find his 39-foot yacht taking on water after a collision with a shipping container left floating on the high seas. With his navigation equipment and radio disabled, the man sails unknowingly into the path of a violent storm. Despite his success in patching the breached hull, his mariner’s intuition and a strength that belies his age, the man barely survives the tempest. Using only a sextant and nautical maps to chart his progress, he is forced to rely on ocean currents to carry him into a shipping lane in hopes of hailing a passing vessel. But with the sun unrelenting, sharks circling and his meager supplies dwindling, the ever-resourceful sailor soon finds himself staring his mortality in the face. On his last film, Margin Call, writer/director J.C. Chandor dealt with a big cast of Hollywood stars, a list of names that included Kevin Spacey, Jeremy Irons, and Demi Moore amongst its numbers. The cast of his follow-up, All is Lost, has only one. Granted, the man is Hollywood royalty – Robert Redford, star of Butch Cassidy and the Sundance Kid and The Sting – but still: only one. All is Lost begins with the nameless lone character, played by Redford, being awoken from a dead sleep below deck on his boat by the sound of water rushing in. He investigates and discovers that his vessel has been hit by a wayward shipping container that has, apparently, fallen off of a ship and found its way to the man’s boat. The man patches the hole, dries out the flooded radio, and attempts to bail the water out of the hull. 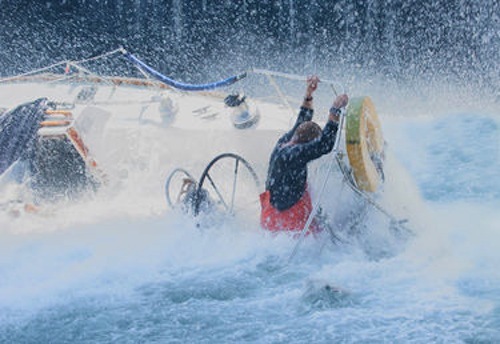 As if his boat’s structural problems aren’t enough, a storm approaches and dumps rain on him, adding to his overflowing boat. The man battles his sinking boat, the raging sea, and the uncooperative elements in an effort to stay afloat long enough to, hopefully, stumble upon a passing ship that can save him. 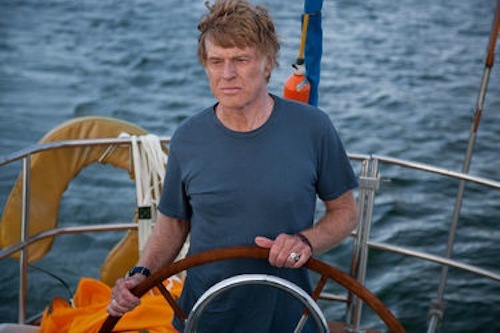 Written and directed by Chandor, All is Lost attempts to be the standout film of Redford’s later career. Visually, it’s impressive; it was mostly shot on location in the Pacific Ocean, with some of the more complicated scenes done in the same tanks in which James Cameron made Titanic. The ocean-faring scenes are fun, but the floating gets old fast. And that’s when the viewer expects a story. And that’s what they don’t get. The chief issue with All is Lost may be that it is trying to be too real. As obstacle after redundant obstacle gets thrown at the unlucky man, he goes about tackling them just like any self-preserving person would. In real life, this is how it would happen; on the screen, it’s tedious and monotonous. There’s only so much patching and bailing that the audience can watch before getting bored. Quite honestly, this film probably would never have gotten made if it didn’t star Robert Redford, who is, you know, Hollywood royalty. Because of the limited setting, cast, and dialogue, All is Lost is a risky film. Unfortunately, the risk does not pay off. The story is an interesting concept that suffers in the execution. It’s a man-versus-nature disaster story; Robert Redford against a powerful sea. The problem lies in the fact that there’s not enough story to sustain interest for an entire movie. After the initial crisis and temporary resolution, All is Lost starts to fall apart. Without any subplots or subtext, it’s just a paint-by-numbers survival tale. It’s the type of film that people will pretend to enjoy because they think that they’re supposed to like it, but won’t be able to explain why. It takes a lot of charisma for an actor to carry a movie on his own, and Robert Redford just doesn’t show that he’s got it in All is Lost. His performance is mechanical and wooden, completely devoid of any emotion or energy. It doesn’t help that the script has no more than a dozen lines, half of which are spoken in an opening monologue, but it’s more than just the absence of speaking; without another actor off of whom to play, Redford is, excuse the pun, drifting aimlessly. The movie is a disaster/survival story, so it’s not supposed to be fun to watch, but Redford’s performance is just awkward and stoical. There is never any fear, sadness, or desperation. There isn’t even any joy or happiness when he does score small, albeit temporary, victories. There’s nothing to inspire empathy or sympathy in the audience. There’s nothing to imply any type of a connection or any sort of a relationship. In short: there’s nothing.